I told you before how my daughter, years ago, won a shopping spree at Neiman-Marcus, and she would treat us to lunch in their restaurant. That is where we discovered our love for the best popovers ever! They serve their popovers with strawberry butter, which is so luscious. I had some homemade raspberry jam and decided to mix a little of that into some butter, and put it into this pretty dish. I bought these little jam/butter dishes at the Mikasa outlet before they closed their stores, and use them all the time. I adapted this recipe to make 6 popovers, because that's the size pan that I have. You can see how big the popovers are in comparison to my teacup! You must have the eggs and milk warm before mixing, and to let the batter sit for an hour before baking. Serve with butter that has some fruit preserves mixed in...yum! Preheat the oven to 450 degrees (or plan on doing this halfway when the batter is resting for an hour). Place the milk in a bowl and microwave for about 1 minute, or until warm tp the touch. Crack the eggs into the bowl of an electric mixer fitted with a wire whisk and beat on medium speed for about 3 minutes, until foamy and pale in color. Turn down the mixer to low and add the warm milk. Gradually add the flour mixture and beat n medium speed for about 2 minutes. Turn the mixer off and let the batter sit for 1 hour at room temperature. Spray a popover pan generously with nonstick spray. Fill the popovers cups almost to the top with the batter and place the popover pan on a cookie sheet. The popovers will rise about 3-4" so make sure your oven racks are spaced properly. Transfer the pan to the oven and bake for 15 minutes. Turn down the oven temperature to 375 degrees and bake for 30-35 minutes longer, until the popovers are a deep golden brown on the outside. Turn out the popovers and serve hot. Kitty I have made these and they are wonderful! I just organized my basement and spotted the popover pan :-) Now I have to make them again! I could eat them for dessert. I haven't made popovers in Years! You brought back sweet memories. These looks so yummy. Hi Kitty, I love popovers and thanks for sharing this recipe with us at Cooking and Crafting with J & J.
Hmmm...berry butter! I really must get a popover pan. Hi Kitty, Wow this is amazing. Love it and thanks for sharing the recipe. Great idea for the butter. I need to purchase a popover pan. I need a pop over pan now. They look delicious. Thanks for sharing the recipe. They look delicious!My sons love them!Here we say "bolinho de chuva"(little rain cake-maybe...) and we eat them with sugar and cinnamon powder! YUM!! Popovers and butter! There is a store that makes huge popovers and serves honey butter that I enjoy going to! Thanks for the recipe! Yum! Strawberry butter looks luscious and would taste ever so lovely on your popovers, Kitty! I haven't made popovers but I do make Yorkshire pudding with is basically the same thing. Next time I make them, I will double the batch and I will try your strawberry butter on them.Happy June, my friend! I can't recall ever having popovers before, although I have tried Yorkshire pudding. 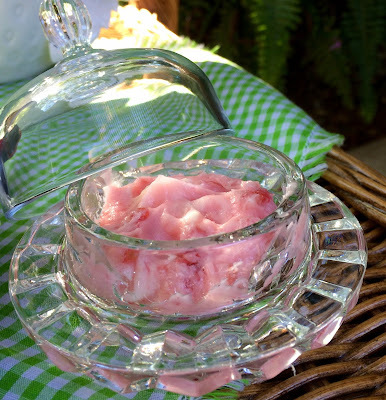 This is the first time that I've ever heard of strawberry butter. What a yummy idea! Oh, my word! These look amazing! And, I would never have thought to add the jam to the butter!! I have seen my husband and his dad mix butter and jelly together at breakfast, so I guess that is similar! I don't have a popover pan...I wonder if a muffin pan would work, if I didn't fill them too full? Thank you for another wonderful post, sweet friend. Praying for you and sending hugs! Oh, my word! These look amazing! So few ingredients yet such a delightful creation! I've never tried making popovers, Kitty. Actually, I'm not sure I've ever even eaten one but I sure would like to. Love your little cloche/butter dish! I used to love our Mikasa outlet before it, too, closes. Your strawberry teacup is beautiful, too. Pinned! I've always wanted to try these! I DO love me some bread of ANY kind. I haven't made popovers in YEARS!! Your post has made my mouth water. I also never thought of flavoring the butter with fruit -- how decadent and yummy. Those dishes are to die for -- I think I will be looking for those on ebay, etc. How big are they? 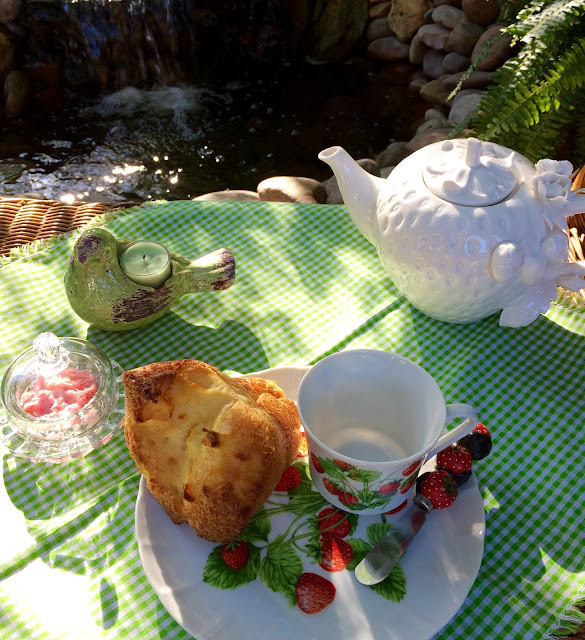 I remember making popovers in Home Economics class.I am sure yours are delicious especially with the raspberry butter in your pretty dish.Your strawberry dishes are delightful as well as the setting. I need a pop over and that fruited butter. My gosh they look so good! How delicious these look. They would be wonderful with the fruit-flavoured butter and a cup of tea. I'll be right over. Your popovers looks delicious! Coffee for me a popover please! I hope that you have a wonderful day dear Kitty. Have a beautiful day, my sweet friend. Love and hugs! I have never made popovers and so I am printing out your recipe to try. They look delicious and also the butter idea is very special - must do that too! Thank you Kitty for faithfully joining my blog party each week! 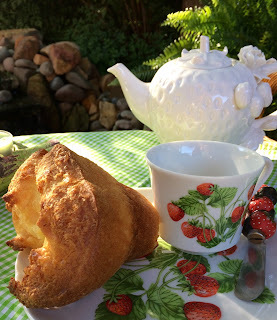 We love popovers--try mine on my blog that doesn't require preheating the oven! Lovely post, my friend. I have not made popovers for years! This is a good incentive and so elegant. Have a wonderful day. I love popovers, both savory and sweet. I have to get my popover pan out. Wonderful popovers kitty. I am in need of a lovely recipe, since I bought a large popover pan. The raspberry jam butter sounds wonderful. A nice treat to have with your tea. Hello Kitty, we were so happy to feature this recipe at our Cooking and Crafting with J&J! Thanks for sharing all of your wonderful recipes with us. I love Popovers and your Popovers look fantastic! Your setting is lovely and so inviting. Your post is awesome and thanks so much for sharing it with us at Full Plate Thursday. Hope you are having a great day and come back to see us real soon! Kitty, I need to try these because they look so good. Have a great week. Sylvia D.